You can become quite bored performing the same old routine that was once quite effective, but now seems to not being doing so well. This often happens to people who use a personal trainer and then go on their way after accomplishing their goals. The exercises you learn are always effective if you change load and repetitions, but this is no cure to staying excited with working out. New exercises are ones that take the place of existing training program routines. For example, it could be simply switching the stance of an exercise such as regular deadlifting to sumo deadlifting. You could also change the exercise entirely to target the same muscle region. An example for this would be performing barbell biceps curls instead of seated incline dumbbell curls. Using a variety of different equipment types may also be the solution for upgrading your workout routine. 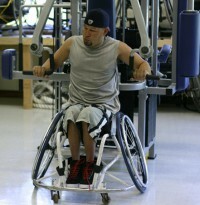 This refers to performing a similar exercise with a different type of equipment. For example, the bench press is very popular for both men and women these days. But this exercise tends to make a lot of fitness enthusiasts feel unfulfilled. Sometimes it is even a frustrating exercise during rush hours at the gym where the benches are always being used. The bench press, for example, can be replaced by performing cable chest presses with a flat bench placed between two cable pulleys. This mimics the exercise and provides similar results for chest focus. Another way to look at this is something like using a straight bar on the cable machine, and then replacing it with triceps rope pull downs. The triceps muscles are being targeted with a different piece of equipment. When an upgrade for your workout is required, a good way to accomplish this task would be to add in HIIT at least once a week, or even every other week. HIIT stands for high intensity interval training, and is the process of changing your intensity levels from low, moderate, and high over the course of training. The intensity changes can be mixed up completely such as low to high, high to moderate, moderate to high, and high to low. Your body will react differently to the shock of something new and rather advanced compared to normal rest times between performing a resistance based exercise. HIIT is usually performed with cardio based exercises, but you could also mix up low weight resistance exercises to complete the same task. You do not have to be confined to a gym atmosphere to get a great workout in. Make things more interesting by going out and performing something other than weight training and running on a treadmill. Enjoy the outdoors and the fresh air in your lungs compared to training in doors where it is stuffy and full of body heat. Some activities to consider that upgrade your workout and boosts training potential are rock climbing, hiking, canoeing, swimming, jump training, and even simple runs at the park varying your intensity levels. This would be one of the easiest upgrades for you to consider. Plenty of people rather attend the gym without a partner, but this could make you lazy and sometimes even lonely. Consider asking a friend or loved one to train with you. This could make the experience more exciting by training with someone who is seeking to change their body physically as well. Aside from that, you should also consider training with a partner so you can increase your load amounts for exercises such as the military press. Having a partner means you now have a permanent spotter for the day to allow more weights to be moved. Just do not team up with a partner that promotes negative energy to your training program. Surprisingly most tend to think you need a gym membership to gain any training benefits. However, upgrading your workout programs to having a full week of bodyweight training only allows you to strengthen your muscles further and boosts your muscular endurance as well. Even people who perform high amounts of bench pressing tend to be only capable of performing a small set group of push-ups. Notice how you offset the days you target a muscle region. 24 hours of rest are required to allow protein enough time to repair injured muscles and stimulate muscle growth. Rest implies you still walk around and perform normal tasks, but not specific physical training is used for the muscle region being rested. This could lead to overtraining of muscles and injury. Why not give a competition a try? This could be anything from power lifting competitions to bodybuilding competitions. The point is to drive your focus on winning and appearing in top shape for everyone who sees you. This is motivating for a lot of people regardless if they ever win. Enroll in a competition that is around 3-6 months away, which gives you time to prepare and occupy your mind with something to look forward to through training. How does this upgrade your workout program? The reason this is helpful is because it gives you a reason to change your training routine. You will get pretty bored of exercising if you never change your goals, and goals are accomplished through proper training and dieting. For example, bulking means you consume more calories to add extra weight while performing heavy lifts. Then perform a cutting cycle that lowers the calories into a deficit while performing cardio based training routines. Upgrading your workout with the previously discussed hacks is pretty simple. Try not to do too many changes at once because you may frustrate yourself or leave no more room for things to upgrade with. Always consult your physician first if you have had any previous medical conditions. Demmy James is a fitness buff, strength and conditioning coach and content contributor with Muscle & Strength. He is constantly looking to inspire and motivate through his writings. Demmy thank you for the tips! I am always looking for ways to increase and improve my workouts.